This world is not for cowards. Do not try to fly. Look not for success or failure. Join yourself to the perfectly unselfish will and work on. Know that the mind which is born to succeed joins itself to a determined will and perseveres. … Live in the midst of the battle of life. Anyone can keep calm in a cave or when asleep. Stand in the whirl and madness of action and reach the Centre. If you have found the Centre, you cannot be moved. In this quote, Swami Vivekananda shows us the “path of enlightened will” (buddhi yoga) through five crisp messages. The first message is to call on the heroic spirit lying dormant within us. “This world is not for cowards…”, instead ‘be heroic, be heroic’. This message is for ‘warriors of the spirit’ – all of those who seek to lead a life more than ordinary, a life leading to the Highest Reality. The heroic stance is the fundamental basis for the life of a warrior of the spirit. The second message which Swamiji shares is the idea of renunciation. He says that renunciation does not come from withdrawing from the field of battle. It does not come from walking away from the warp and weft of daily struggles. Rather, he points out, renunciation means being unattached to success or failure – i.e., don’t be overly worried whether your efforts are valued by others and you are receiving acknowledgement for whatever you have done. This allows us to detach ourselves a little from the constant ‘merry go-round’ of success and failure, in which we are entrapped. Swamiji then shares his third message – the value of an ‘enlightened will’. The ‘enlightened will’ gives us the single-minded determination and focus on a purpose or vision larger than one’s own narrow self-interest or limited vision of life. It enables us to persevere and struggle towards such a purpose despite innumerable difficulties and obstacles. When we work with such an ‘enlightened will’ – directed to a great vision or purpose – we are able to gradually, with perseverance – transform even the highest vision or purpose into a reality. Swamiji assures that an individual who is able to work in this way has to succeed. 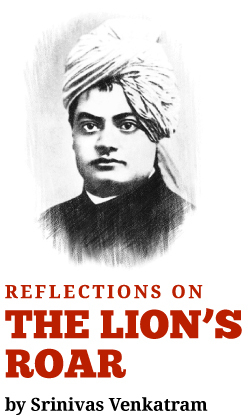 Swami Vivekananda now gives us the fourth message – how to act with a silent, calm mind in the midst of the whirlpool of life. Such a silent, calm, mind is able to see through the swirling waters of day-to-day life with all its infinite inessentials, and maintain focus on what is essential in one’s life. The enlightened will is an invaluable asset in maintaining such a focus on essentials. This nature of a calm, born out of intrinsic clarity and focus, is very different from the calm that comes because of an absence of disturbance (‘living in a cave’), or the calm that comes out of an unthinking, uncaring inertia in one’s mind (‘asleep’). Such an intrinsic calm is never disturbed in contrast to the calm born because of an external peace (which is easily disturbed); or the calm born because of lack of awareness (which is no calm at all!). Swamiji then leads us to the fifth message, the outcome of leading such a life. When one works with an enlightened will towards a purpose larger than oneself, persevering despite external obstacles and contrary ideas within ourselves, then one will not only succeed in realizing one’s purpose or vision, but more important, one will be led, unerringly to the Centre – the Highest Truth that lies underneath the confusions and impermanent events of day-to-day life. When one reaches this Centre, one has realized or actualized the Truth within; one will no longer be swayed or confused by anything lower or less permanent; one will reach the source of all Strength; one will be Free in the midst of life itself.